Joey Carbery suffered a suspected broken arm in Ireland's edgy 23-20 win over Fiji in Dublin. The Leinster playmaker's two missed conversions almost proved costly, as Ian Keatley's two late penalties squeezed Joe Schmidt's men home. Ireland boss Schmidt admitted Carbery will miss next weekend's final November Test, against Argentina in Dublin on Saturday. "I think he's fractured his left forearm," said the Ireland head coach of fly-half Carbery. "I can't absolutely confirm that but that appears to be the case. "That will mean he won't take any further part in the series for us." Ireland squandered a 17-3 lead built up by tries from Darren Sweetnam, Dave Kearney and Jack Conan, and almost paid the price for 22-year-old Carbery's two missed kicks. Keatley's two penalties turned the tide for Ireland after Fiji had levelled at 17-17, leaving Schmidt relieved - but also hailing Carbery's performance on just his second start in six caps. 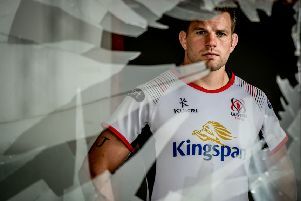 "Joey was a bit special the way he cut the line and got that pass into the hands of Darren Sweetnam, who finished comfortably for the try," said Schmidt. "I thought Joey's ability to organise others is coming along; his vision is really good. "The threat he poses at the line himself, he ducked and dived, but he's brave, potentially to a fault. He pays no heed as to what's in front of him." The versatile Carbery enjoyed his first start of the season at fly-half against Fiji, having featured at full-back for Leinster this term. Ireland view Carbery as a natural number 10, and want the New Zealand-born talent to become a genuine alternative to British and Irish Lions star Johnny Sexton. Schmidt insisted Ireland must accept Leinster's need to deploy both Carbery and Sexton in their starting line-up, even if it denies the youngster regular opportunities at fly-half. "Look, it is what it is, it's an unfortunate situation for us, but I totally understand it," said Schmidt, of Leinster regularly fielding Carbery at full-back. "They've got Johnny Sexton at Leinster, so Joey takes his opportunities at full-back. "I just appreciate that he gets game time and is in good condition to play. "I'd love him to play 10 more often, it would help his development, but it's a needs-must situation." Head coach John McKee admitted Fiji will leave Dublin frustrated not to steal victory, having levelled at 17-17 and again at 20-20. "There's some frustration for us, we had chances to score another try and secure the win," said McKee. "To come back from 17-3 down was a great effort, but maybe that took too much out of us."